1. Heat 1 tbsp ghee in a pan and fry the cashews till light golden. Add rasiins and fry until plump. Remove to a paper towel and keep aside. Now add vermicelli and keep on stirring until light golden. It takes about 3 – 4 minutes over medium heat. Remove the pan and set aside. If you are using roasted vermicelli, just add them to the pan and stir for a few seconds so as to coat it with ghee. 2. Meanwhile bring the milk to a boil in a thick-bottomed vessel / uruli / sauce pan at medium heat stirring occasionally so that the milk wouldn’t stick to the bottom. Bring down the flame and heat for a few more minutes. Then add the fried vermicelli. Mix well. Cook over medium low heat for about 8 – 10 minutes, stirring in between. Add sugar. Mix well and continue to cook for another 8 – 10 minutes, stirring occasionally, until the vermicelli turns soft and the payasam begins to thicken. If it is very thick, you can add 1/4 cup of milk and heat for a few more minutes. Switch off when it is medium-thick. Add the cardamom powder, fried cashews, raisins and stir well. This payasam tends to thicken when it cools down. Serve warm or chilled. It goes well with sweet boli. Parippu Pradhaman…..it’s time to Celebrate! wow…. looks perfect with the correct consistency…. so when are u inviting me over???????? I love it chilled!!! 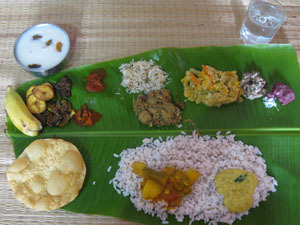 കല്യാണിക്കുട്ടിയുടെ ഇല കാലി ആയി. അഹേം….. ഇനി ഒരു പായസം ആകാം. ഒരു തവി പായസം ഇങ്ങു ഒഴിചേക്കൂ മായക്കുട്ടി …. Payasam looks creamy,rich and super delicious. Looks so creamy and yuumy kheer. My hubby’s fav , looks so yum! Semiya looks yummy and delicious..Love to have it anytime..
A classic dessert.. love it! Yummy yummy payasam..adipoli,love semiya payasam. Absolutely delicious!! ente molude fav annu ithu..kandittu kothiyavunuttoo..
my son’s fav… luckily he did not see it..otherwise he will demand for some… yummm..